Note: An updated post with figures on 2016 births can be found here. The 14th Amendment to the U.S. Constitution, adopted in 1868, grants an automatic right of citizenship to anyone born in the United States. But in recent years, some politicians have called for repeal of birthright citizenship, including Republican presidential candidate Donald Trump, who says that so-called anchor babies are a magnet for illegal immigration. A Pew Research survey in February 2011 found that a majority of Americans (57%) opposed changing the Constitution to end birthright citizenship, while 39% favored such a change. That same survey found that most Americans (87%) said they were aware of the constitutional guarantee of birthright citizenship. There were an estimated 11.3 million unauthorized immigrants living in the U.S. in March 2013, according to a preliminary Pew Research estimate. They make up 4% of the population, but their share of births is higher because the immigrants include a higher share of women in their childbearing years and have higher birthrates than the U.S. population overall. These estimates are based on data from the U.S. Census Bureau’s Current Population Survey and American Community Survey, using the widely accepted “residual methodology” employed by Pew Research for many years. 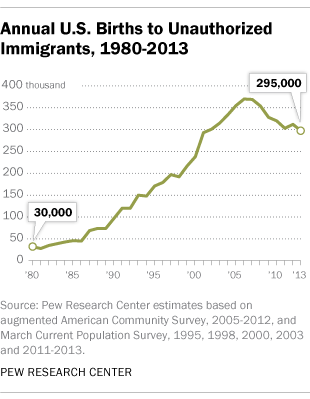 Most children of unauthorized immigrants in the U.S. are born here, and therefore are citizens. In 2012, there were 4.5 million U.S.-born children younger than 18 living with unauthorized-immigrant parents. There also were 775,000 children younger than 18 who were unauthorized immigrants themselves and lived with unauthorized-immigrant parents. These totals do not count U.S.-born children of unauthorized immigrants who do not live with their parents. The nation’s unauthorized immigrants are more likely than in the past to be long-term residents of the U.S., and are increasingly likely to live with U.S.-born children. In 2012, there were 4 million unauthorized-immigrant adults who lived with their U.S.-born children, both minor and adult. They made up 38% of unauthorized immigrant adults. By comparison, in 2000, 2.1 million unauthorized-immigrant adults, or 30% of this group, lived with their U.S.-born children, minor and adult. These new estimates, which include a 2008 estimate of 355,000 births to unauthorized-immigrant parents, differ slightly from a previous estimate for 2008 of 340,000 births to unauthorized parents, because they use different data sources and methodology.